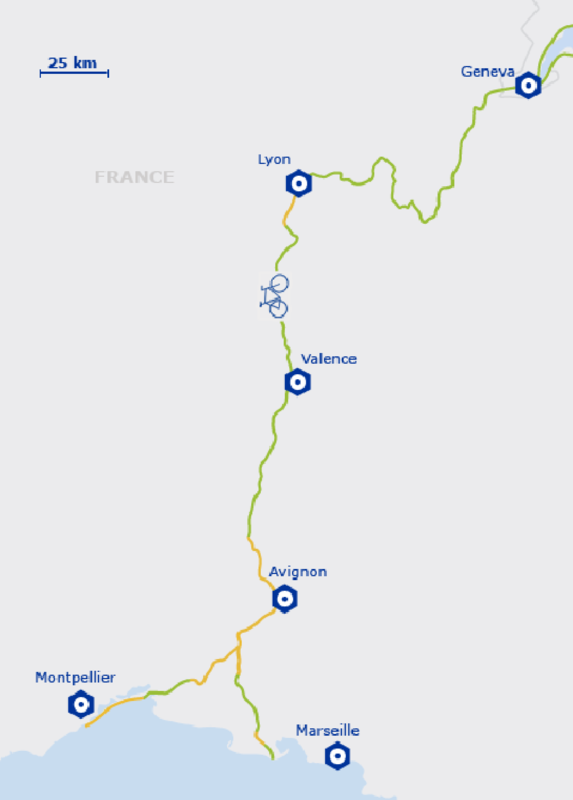 The Trans-European Cycle Route 17 (EV17) in Provence : it is taking shape ! 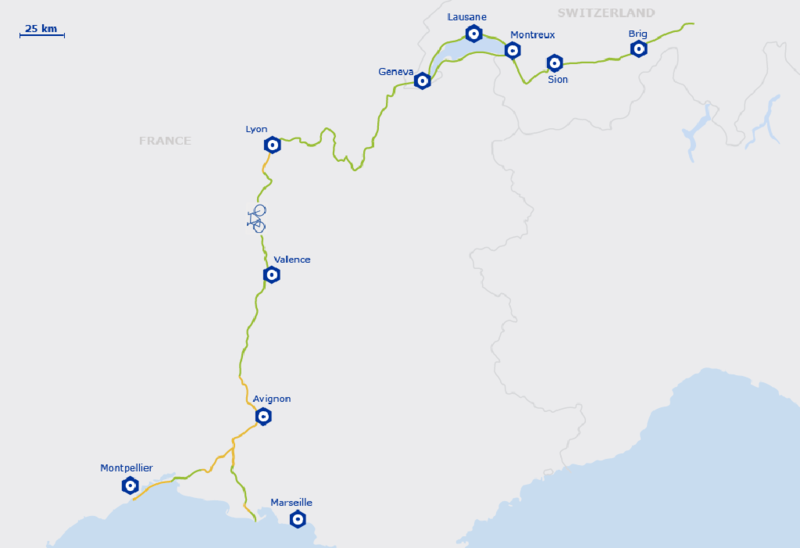 The Trans-European Cycle Route 17 (EV17) is part of the EuroVelo Network set-up by the European Cyclists’ Federation (ECF). It follows the Rhône on 1,165 km from ■ Gletsch in the Swiss Alps to the coast and the beaches of the ■ Mediterranean Sea in the south of France. This route is known as ViaRhôna and also La Route du Rhône on the Swiss side of the border. It joined the EuroVelo network in 2016. Signposting has been carried out with ViaRhôna logo and completed with EuroVelo 17 logo. Althrough work in progress is not frequently updated, online maps of the sections together with description in french may help at Carte des services ViaRhôna - Région Rhône-Alpes . At Beaucaire, the eurovelo 17 splits into two sections : The western route - (Common stage with EuroVelo 8 - runs closed to the Petit Rhône at Saint Gilles and then leads to the port of Sète (region Languedoc Roussillon) through the Camargue Gardoise taking the old towpaths of the Canal du Rhône à Sète. 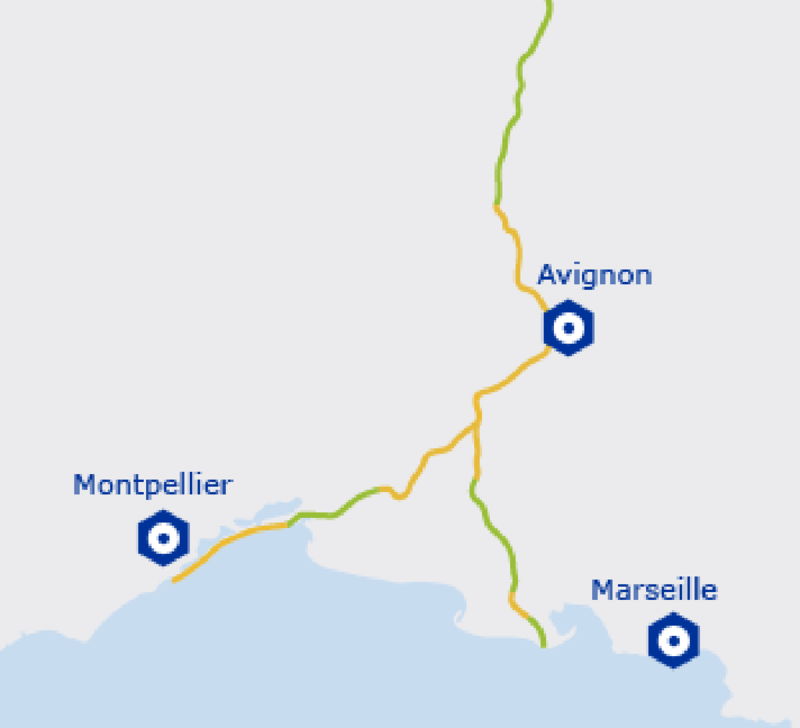 The eastern route continues alongside the Rhône river through the Camargue and leads down to Port-St-Louis-du-Rhône where it reaches the sea at Plage Napoléon. All the way to Sète (final destination), it takes the same route than the EuroVelo 8 that leads to Andalousia.